Flooring contractors are invited to the St. Louis, MO area from June 6-7 for and Advanced Sand and Finish Class. Instructors Bob Goldstein and Greg Mihaich will lead several days of hands-on training in sanding and finishing. Attendees will have the opportunity to work with Norton abrasives and PolyWhey® Professional Wood Floor Finishes. 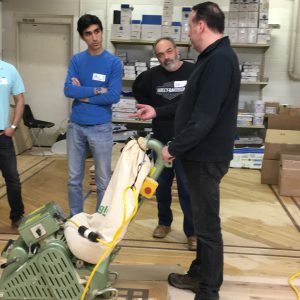 You’ll master advanced sanding techniques for minimizing scratch patterns and getting an optimal finish on all species of wood and parquet floors, techniques for working with PolyWhey to achieve flawless results and how to make seamless repairs in stained floors. Each participant will receive two credits toward an NWFA degree. To reserve a place, please contact Audrey Hix at 802-473-3292 or ahix@vermontnaturalcoatings.com. The deadline to register is May 24.